Festival Players are very proud and very excited to be presenting the Cambridge premiere of Andrew Lloyd Webber’s CATS. Performances will be at the Mumford Theatre, 7-16 June 2018, directed by Suzanne Emerson, with musical direction by Joe Griffiths. 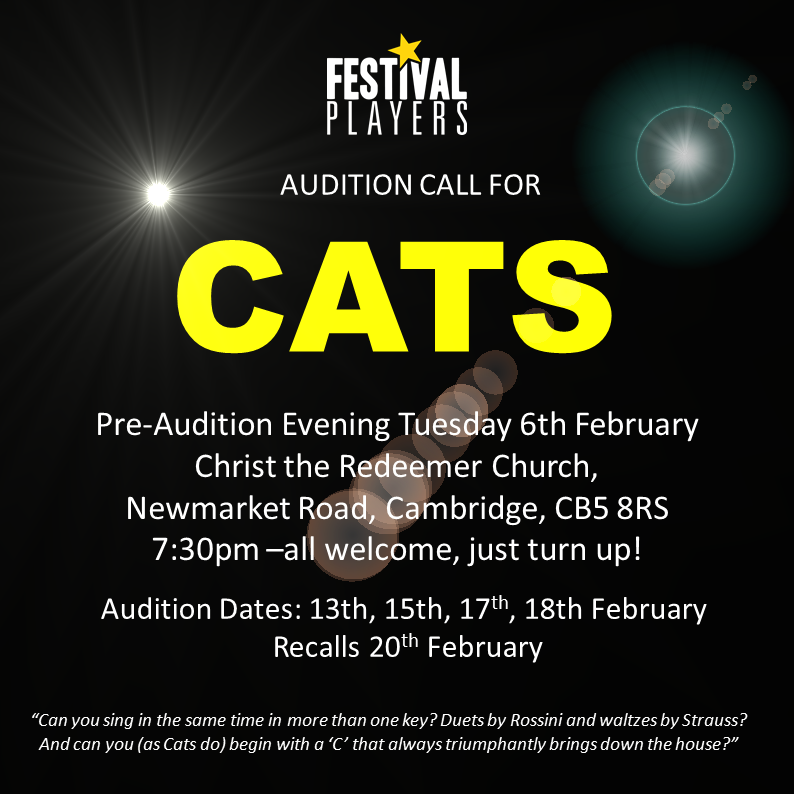 The pre-audition evening will be on Tuesday 6th February at Christ the Redeemer Church, Newmarket Road, Cambridge, CB5 8RS. Starting at 7:30pm – all are welcome, just turn up! Auditions dates are 13th, 15th, and either 17th or 18th February (TBC) with any recalls on 20th February. Booking for audition slots opens at the information evening. This is a chance to be part of one of the most iconic and best loved musicals of all time. We’ll need a large company of performers of all ages and talents – this is not going to be just a high-kicking gymnasts, lycra and legwarmers show. Suzanne has some great and different ideas on presentation and interpretation! The team are looking for a large company of all ages and talents, and auditions are open to those 16 and over.